How Fast Should a Business Respond to an Email? — Toister Performance Solutions, Inc.
How Fast Should a Business Respond to an Email? Email is a critical customer service channel. A 2017 study from inContact revealed that just 43 percent of customers were highly satisfied with their most recent email customer service interaction. Those who were happy cited speed as a top delighter. The average company takes 12 hours and 10 minutes to respond to an email, according to a 2018 study from SuperOffice. That's certainly better than the old one business day standard, but is it fast enough? 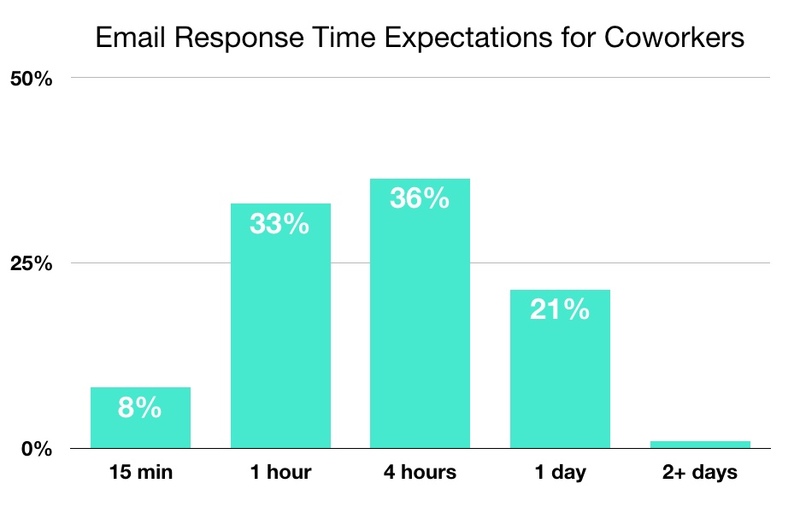 In April 2018, I surveyed more than 1,200 consumers to learn exactly how fast they expect businesses to respond to emails. The survey also examined response time expectations for Twitter and Facebook messages. You can read the analysis below or browse the data yourself. This is the first time I've done this study since 2015, when those results revealed the new email response time standard was just one hour. The 2018 study surveyed more than 1,200 consumers to see if this has changed. 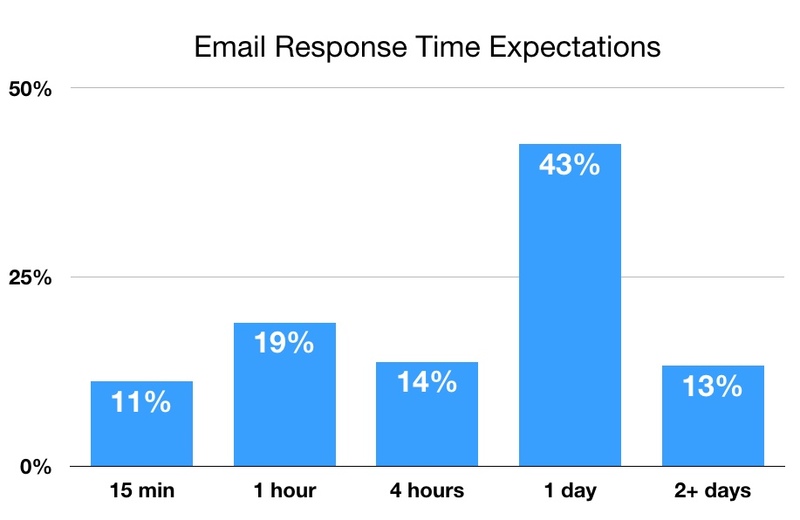 Participants were asked how quickly they expected a response when contacting a business via email. Response time expectations for Twitter and Facebook messages were also assessed. Finally, the study examined whether response time expectations varied by age group. 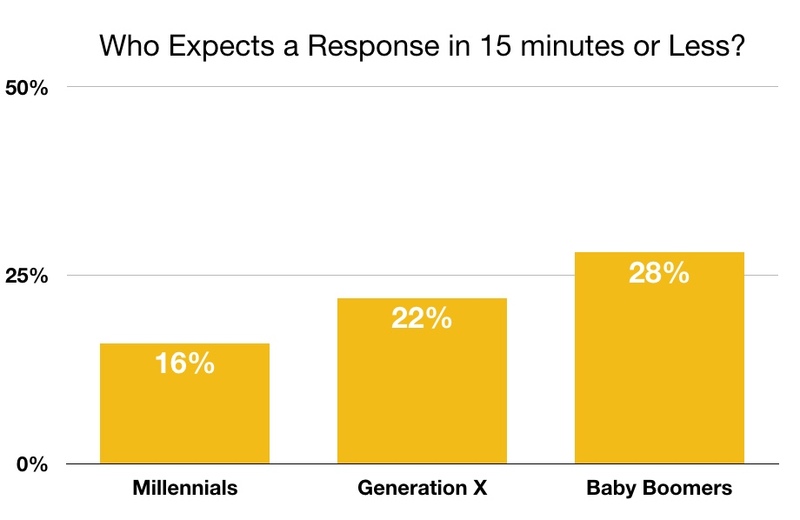 For instance, do Millennials expect a faster response than Baby Boomers? The age groups were defined using definitions from the Pew Research Center. One note, too few members of Generation Z (ages 21 and under) and the Silent Generation (ages 73 and over) participated to include their perspective in the age group portion of the study. Businesses should target a response time standard of one hour, with 15 minutes representing world-class service.. This conclusion comes from looking at the response time that will meet the expectations of at least 80 percent of customers. This can be a little confusing at first because the top choice was one day, with 43 percent selecting it. But one day only meets the expectations of those who selected one day or 2+ days, which is a total of 56 percent. You pick up 14 percent of customers if you can respond to email within four hours, though that's still just 70 percent of the total. A one hour email response time will meet the expectations of 89 percent of your customers. Companies aiming for world-class customer service should respond within 15 minutes or less. 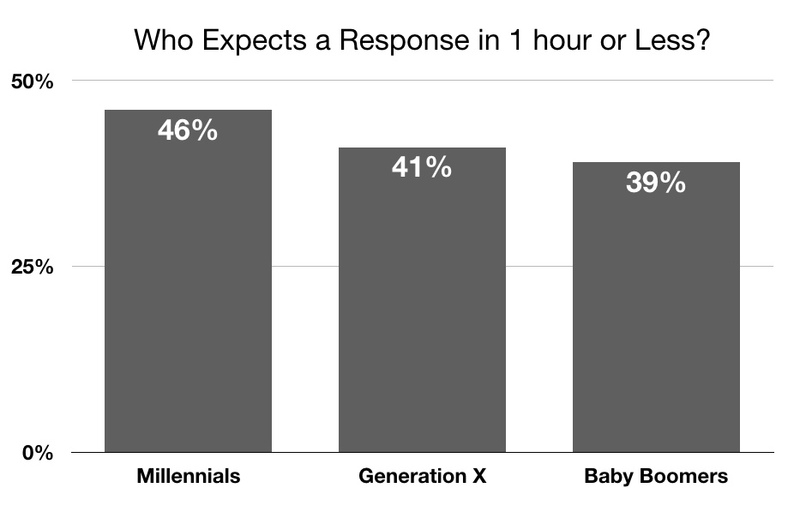 The study looked at response time expectations by age. The responses were fairly close together, but there was a mild surprise. Baby Boomers want the fastest response. A smaller group of 206 respondents was asked an additional question: How quickly do you expect a response when emailing a coworker? 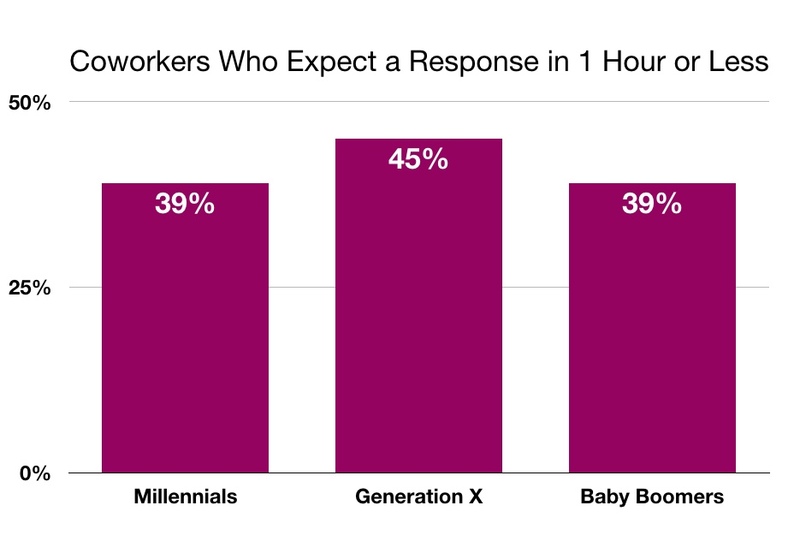 Response time expectations for this group are very high and arguably unreasonable, with 41 percent of people expecting coworkers to respond to email within one hour. The pressure to respond quickly causes many people skim and scan emails from colleagues. They then send partial responses which generates a lot fo unnecessary back and forth. One study found that the average email conversation at work includes 4.5 messages. Which generation has the highest expectations for coworkers? Generation X leads the pack on this one. Businesses should target a response time standard of 15 minutes. Anything slower that 15 minutes risks disappointing a large portion of customers. This can present a challenge for businesses as Twitter is not as popular as more traditional service channels such as email, phone, or even chat. There may not be enough volume to justify staffing for a 15 minute response time. One note from the study is only 40 percent of participants message businesses via Twitter. That percentage is only slightly lower for Baby Boomers, with 35 percent saying they use Twitter for customer service. Businesses should target a response time standard of 1 hour, with 15 minutes representing world-class service. A one hour response time may be adequate for most customers, but 17 percent still want to hear back more quickly. 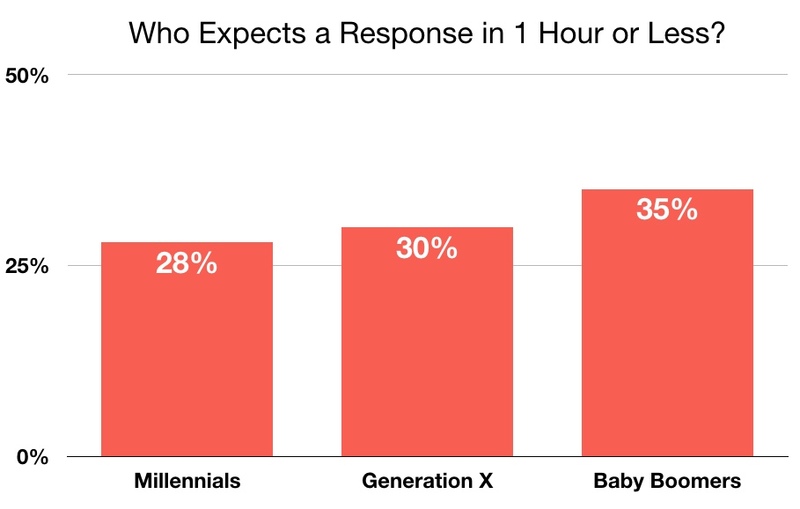 For Facebook, it's Millennials who want the fastest response. Only 50 percent of participants message businesses via Facebook. Millennial Facebook usage is slightly higher than the group average, with 55 percent saying they have contacted a business via a Facebook message. I hosted a webinar where I shared some more granular data from the study along with several tactics for meeting customer demands for fast responses. You can watch the webinar replay.